Process excellence has been the predominant approach to improving business operations since the Industrial Revolution. It focuses on how efficiently work is done. That is distinct from improvement efforts to change why work is done (purpose and outcomes) or what to create (products), emphasizing work effectiveness. Process excellence consulting is most impactful when the product to be produced and the purpose for that product have been well-defined and do not need to be reexamined or changed. Process improvement based on the assumptions that purpose and product are just fine, when the reality is otherwise, will always sub-optimize (at best), achieve far less than is possible, and make improvements that may have little benefit to customers and competitive position of the enterprise. C3 assures efforts to achieve process excellence are superbly effective by assuming purpose and product issues must always be addressed first. That is, if the product is not what users want, producing it more efficiently has limited merit. We help you lower the water level, expose and remove the rocks causing greatest turbulence so the flow is fast and smooth. Mastering 8 Dimensions of Excellence (8DX) Workshop This 2- or 3-day workshop sets the context for all improvement and innovation efforts that aim to improve business performance and customer experience. You start by changing how you think about the purpose of your work and identify the most important products and processes whose improvement will create visibly dramatic excellence. The scope of course content includes strategic direction, product/service design, customer differentiation and segmentation, voice-of-the-customer, process mapping, measurement, and innovation. The 8 Dimensions of Excellence framework, with several tools you apply in the session, provides the structure, sequence, and methods for process improvement. Cut over half your process mapping effort, improving simplicity and speed. Identify which part of an entire process to improve for biggest impact. Easily measure process performance relevant to dimensions 4 and 8 of the 8DX framework. Shorten the cycle or response time of virtually any process by 80%. C3 Project Management (C3PM) Workshop This 4-day workshop teaches you how to charter and manage a process excellence or strategic project when the solution is unknown. ISO 9001 Audits and Consulting We marry ISO principles with the C3 system to identify how you can meet ISO registration requirements and kick your quality management system up a notch for competitive advantage. C3 Mentoring This is your personal coaching program, tailored to achieve your leadership objectives while using the C3 principles, system, tools, and structure. Process excellence tools and approaches have advanced considerably since the popularization of statistical methods espoused by Dr. Deming and others. Those statistical methods have reduced process variability and product defect rates, most notably in manufacturing operations. Widespread training of non-experts and the proliferation of process excellence publications has brought process thinking into the mainstream of management practices. The overall effect has been to improve business performance. That’s the good news. Unfortunately, huge opportunity for improvement is consistently overlooked because the mindset guiding the work is stuck in Industrial Age thinking. C3 offers a dramatic and simplified way to beef up the approach and get commensurately huge results. C3 Process Improvement Consulting, Training, and Project Tools correct these barriers to outstanding success. 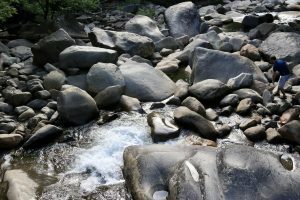 We help you lower the water level, expose and remove the rocks causing greatest turbulence so the flow is fast and smooth. Our approach has been specifically designed for non-manufacturing application (though manufacturers use it, too), strong customer focus is infused throughout, 80% performance improvement and more than 5:1 ROI is common, and our unique root-cause method quickly identifies the critical few issues to tackle for maximum gain. What we don’t do is rely on sophisticated statistical methods or use common tools you can find elsewhere. They have their place but we have found easier ways to achieve eye-popping, sustainable results you can get fast.